You are here: Home › News › Events › Small Works for Big Change 2013 › Volunteers needed for Small Works for Big Change! Outreach (priority) – dropping off postcards, online and event-based outreach. Installing art – we need about 15 people! Please email me if interested. Your support is much appreciated! SMALL WORKS FOR BIG CHANGE! Over 65 works of art for sale at SRLP’s 8th Annual Benefit Art Sale! Saturday 18 May 2013 5 – 9PM. Adee Roberson, AK Burns, Amber Iberrache, Amy Sillman, Anna Betbeze, Anne Hall, Ashai Ntontan, Baseera Khan, Buzz Slutzky, Camilo Godoy, Candice Lin, Celeste Dupuy-Spencer, Cristina Corvucci, Dennis Nelson aka Johnny Cash, Edie Fake, Emmett Ramstad, Emily Roysdon, Emily North, Erica Cho, Erica Wessmann, Guadalupe Rosales, Felipe Baeza, Iris Leslie, Jai Arun Ravine, Jaime Shearn Coan & Zee Boudreaux, Jessica Watson, Jeanine Oleson, Jonah Groeneboer, Jombi Supastar, Just Seeds, K8 Hardy, Kamaria Carrington, Katrina del Mar, Keith Gemerek, Keltie Ferris, Kerry Downey, Kwesi Ferebee, Larry Hoysic, Leah DeVun, Leidy Churchman, Lila Freeman, Liz Collins, LJ Roberts, Logan Macdonald, Lupe Salinas, Mariette Pathy Allen, Marina Ancona, Mia Nakano, Michelle Handelman, Moyra Davey, Nami Hall aka House of Bruno, Park McArthur, Patty Chang, Paul W. von Bex, Peter Gallo, Rachael Warner, Rachel Bookbinder, Rachel Higgins, REH Gordon, Ricardo Carranza, Roberta Rivera, Sabelo Narasimhan, Sadie Bening, Samantha Box, Scooter LaForge, Shaylana, Sophia Wallace, Tara Mateik, Trina Rose, Tuesday Smillie, Ulrike Muller, Vanessa Huang, Xylor Jane, Zave Martohardjono and more! 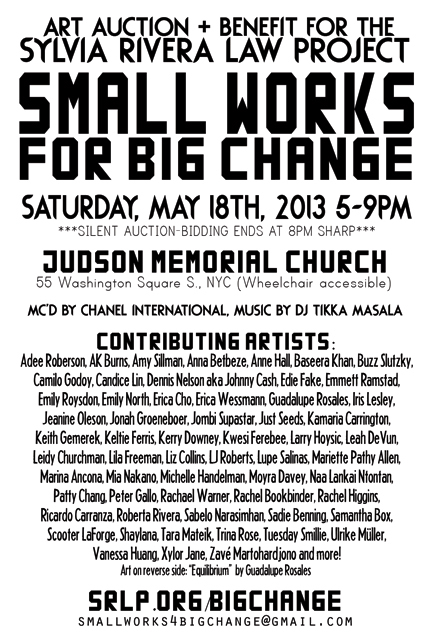 annnnnd fantastic raffle prizes from Riot Grrl Ink, Tekserve, 3rd Ward, La Mama Theatre, NYU Books, Joe Coffee and more!